I had an idea to write a post about the American Robin this week and checked the archives at 10,000 Birds to see how repetitious that might prove to be. 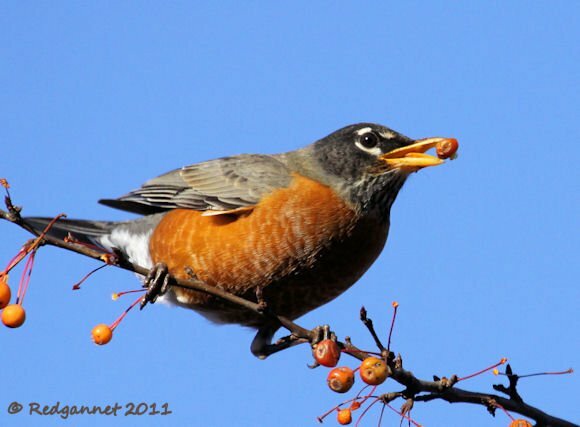 There are plenty of articles, here for example, or here, but the one that caught my attention was from Sharon who passed on an observation from a friend who had seen what they took to be an American Robin actively fishing. This reminded me of an occasion when I noted similar behaviour by a Eurasian Blackbird, Turdus merula. The American Robin in question was unable to access its normal food supply as the ground had frozen and was covered in snow. Heavy competition may have forced the bird to “get creative and adapt to other food sources”. 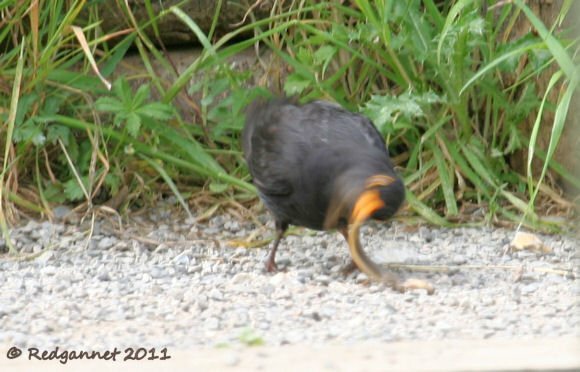 The Blackbird was faced with a similar challenge, except that the ground was rock solid on account of a hot dry spring. 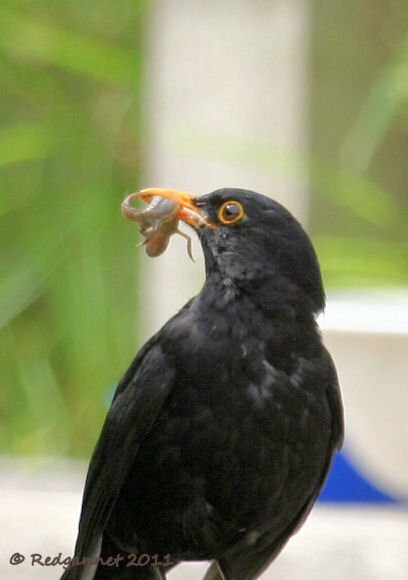 The worms that would have traditionally made up the thrush’s diet were baked into the soil and he needed to explore other feeding strategies. To compound his urgency, he had a new family to feed, so Mr Merula went fishing. At a tiny nature sanctuary close to my home in Kent, UK, there is a small pond. It is shallow and weedy with a platform giving access to the water, enabling school children to pond dip. 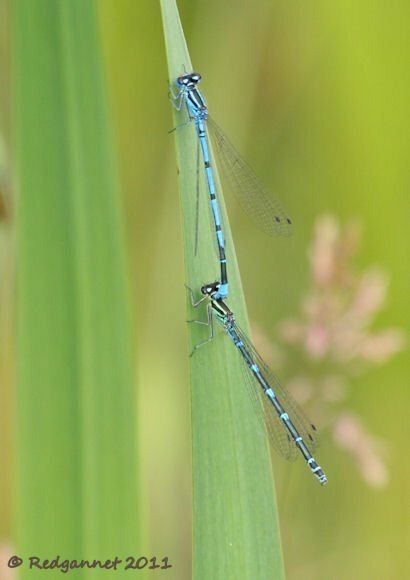 There are no fish in the pond larger than a Stickleback, so I was slightly surprised to hear a splash as I concentrated on a damselfly by the bank. I turned to see a widening circle of ripples emanating from the middle of a small patch of open water. Movement on the far side of the pond caught my eye. It was the blackbird landing on the path with a wet, glistening newt, which it proceeded to batter to death. At this point I must lapse into conjecture as I was turned away from the action as it happened. 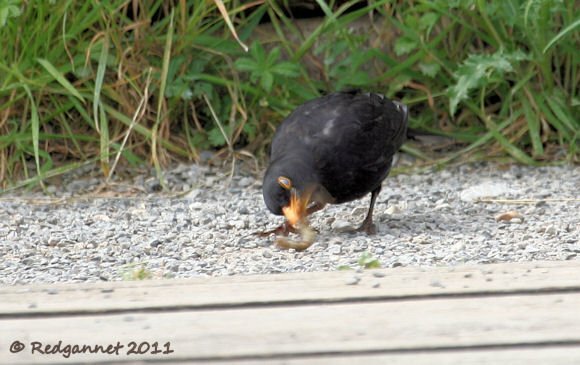 It is my suspicion that the Blackbird caught the newt as it flew across the water. I imagine that it was an opportunistic act rather than a planned strategy, though success may encourage a repeat attempt and it could develop into a regular behaviour. In an attempt to make sense of what I was seeing, I tried to take a sceptical approach. The newt is an amphibian and could easily have been on the path already. The splash may have been caused by the blackbird dropping what was already in its mouth into the water in favour of a better alternative that it had seen on the path. It is also possible that the bird had just vented some pre-digested morsel and then happened upon the newt. Put simply, this is what I saw. The ripple pattern was such that it must have been made by something travelling towards the far bank. A Blackbird was travelling towards the far bank and had to gain height to clear a low wooden barrier and land on the path beyond. It must have been very close to the water’s surface to necessitate this manouvre. The bird landed with the newt already in its bill. I construct these three observations into the theory that the blackbird caught the newt from the water. So, back to the conjecture; how did the Blackbird pluck the newt from the water? Could its legs and claws have been strong and sharp enough to grasp and hold the newt as an Osprey would? I don’t believe so. Could it have plunge-dived like a kingfisher? That would necessitate a nearby perch and a clear intention. It’s unlikely. The splash and the ripples were smaller than I would give credit for if the bird had entered and then re-emerged from the water, plus the bird did not appear wet when it landed on the path on the other side of the pond. Could it have been waiting unobtrusively by the water’s edge, like a heron, for a newt to show itself and then speared it? Don’t be silly, you’ll be likening it to a grebe or a penguin next! The likelyhood is that it was an opportunistic act when the bird had been flying low across the pond and picked out the amphibian as it passed over, in the manner of a Frigatebird picking crabs from a beach. I believe that it is credible, though it must have been a lightening fast decision by the bird to try it. Allow me though to refer back to the possibility that success could encourage further attempts and the development of a strategy. Perhaps this wasn’t its first attempt and it was already developing this strategy. It may have had success in the past with pond insects and dragonflies which abound at the pond. Perhaps the bird had found itself a perch where it could watch the surface of the water and pick off insects like a flycatcher. Catching a newt would merely be an escalation of the technique. The thrush’s behaviour reverted to type once it had landed its prize. It pounded the newt against hard surfaces until it was subdued in the same way that its congeners would batter a snail against an anvil to open it. The strength was apparent in the bird’s neck and gave credence to the possibility that it could have lifted the newt from the water. 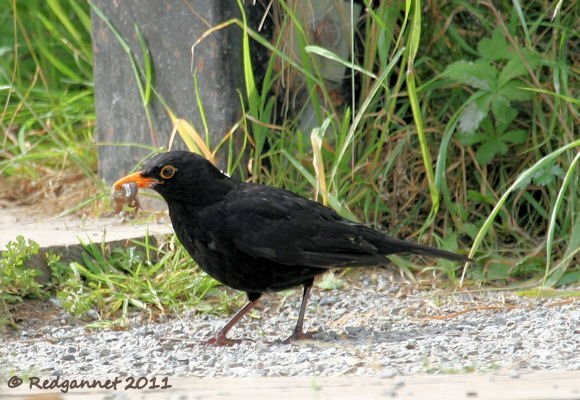 The Blackbird then flew off to his nest, but I cannot say what Mrs Merula made of the unorthodox meal. The chicks must have been of a reasonable size to swallow such a morsel whole. In case you were thinking that this post was a cynical attempt to gain undeserved traffic on the coattails of Newt Gingrich and the up-coming US Presidential elections, it wasn’t, (Republican, Democrat, Electoral College, Cain’s alledged sexual misconduct) but it is now. Happy Christmas and God bless us, every one. Actually, instances of what we would traditionally consider to be non-fishing birds catching fish are not uncommon and have been seen in a few different species. There is a notable example in this year’s Veolia Environnement Wildlife Photographer of the Year, Portfolio 21. Bence Máté caught an incredible image of a Great Reed Warbler plucking a tiny fish from the water. 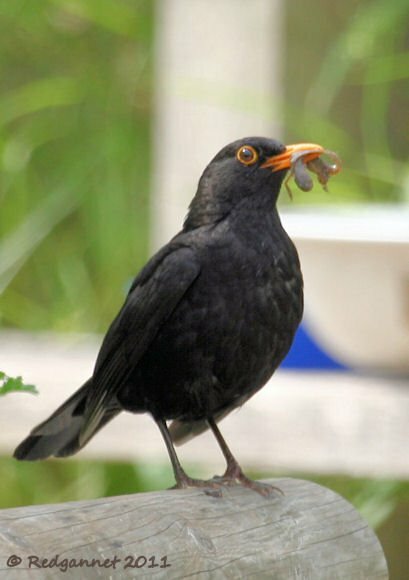 Further to your article, I feel that I have to advise you that I have now witnessed a male blackbird fishing a newt out of out pond. 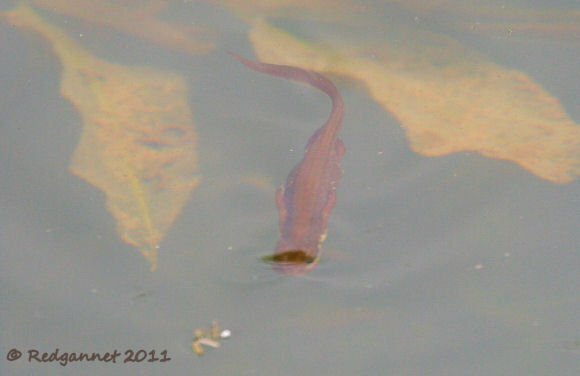 It stood beside the pond and purposefully plucked the newt from the water and flicked and battered it to death as I watched open mouthed. I’m not sure if he took another previously since I saw him with a mouthful of pond weed which he was pecking with intent just before the witnessed raid.